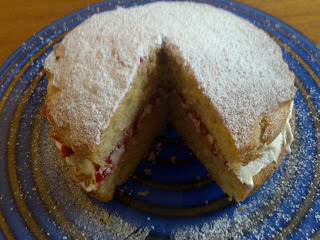 I have just made my first ever sponge cake, let alone first ever Victoria Sponge. I was inspired to pick this recipe out first because of the delicious slice of it i had at Liberty's cafe the other day. It does come out quite big, so i need to go and get some smaller cake tins, unless the cat can be persuaded to help tara and i out. - Mix in a food mixer, 225g self-raising flour, 225g caster sugar, 225g soft butter, 2 teaspoons of baking powder, 4 eggs (large) and 1 teaspoon of vanilla extract. - Add lots of double cream and jam as a filling. Here's a picture taken 1 min later! Clare mentioned that you had started a nigella blog. I hope you don’t mind me checking it out. 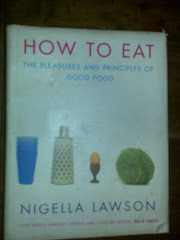 You may be pleased to hear that your/nigella’s victoria sponge provided tasty inspiration for sunday tea yesterday. Furthermore this evening you have inspired me to tuck into pea risotto. cheers paul - i hope both are delicious!